A Russian general and about 100 soldiers and gear are on the ground in Venezuela as part of long-term military accords between the nations, a Venezuelan Information Ministry official said Monday. An Ilyushin IL-62 passenger jet and an Antonov AN-124 military cargo plane arrived at the international airport outside Caracas on Saturday amid rapidly escalating tensions between the U.S. and the regime of President Nicolas Maduro. Russian and Venezuelan officials had been silent about the trip, despite local media reporting their arrival and the fact that the planes bearing Russia’s flag were visible to the public on the tarmac. Sputnik, a Russian state news outlet, cited unnamed embassy officials in Caracas to report that the troops and 35 tons of cargo under the command of General Vasily Tonkoshkurov arrived to “exchange consultations.” A Venezuelan Information Ministry official, speaking on the condition of anonymity because he isn’t authorized to comment publicly, said the visit was to perform maintenance on Russian military equipment the nation had purchased. This is a big challenge to U.S. This is a worrying - how much longer Guaido and the international community are going to wait while the regime and Maduro in Venezuela have enough time to prepare thank to the Russians. Things are escalating! I had the same thoughts when I read the article. Maybe not a "cold" war but at least a "chilly" one anyway! 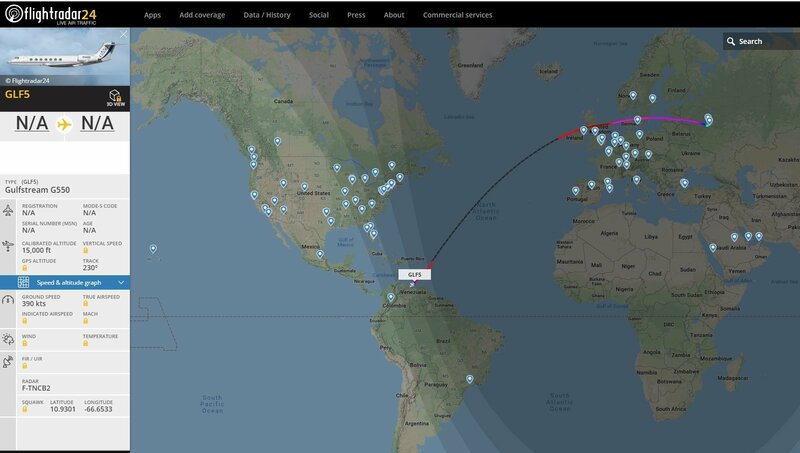 Unregistered, private, luxury, executive jet tracked from Russia to Venezuela. Pretty sure I mentioned this here before, a couple months ago. It wasn't just this one article that made me think that we are in a "Chilly" war situation with Russia. The article just triggered my mind to the realization that that is precisely where we are. Contemporary Russia is no different than the USSR of the Cold War days with respect to the fact that they are still actively trying to acquire (or re-acquire) real estate. Communist USSR tried to spread socialism all over the world. Contemporary "democratic" Russia under Putin is trying to re-acquire all of the territories they lost when their economy finally collapsed at the end of the Cold War and they could no longer afford keep the satellite countries under their rule. The Cold War of old vs the Chilly War of today from the perspective of the USA is still the same in that we would prefer that the individual countries are not (essentially) bullied into submission by a larger colonial power but left to their own self-rule. This author did a good job of making me think about our current situation. Sorry dear friends there will be no revolution in Venezuela. Maidan backed by West was finally a turning point for Russia and a bridge too far. You cant expect Moscow to non stop retreat from Eastern Europe, Syria, Ukraine and Venezuela. No sane man can expect this maybe only elites of exceptional nation. Surely not after broken promise made in 1990 to not expand NATO eastward even by one inch. Do you remember that? Because Russian do remember and will NEVER trust West at least during next generation. And Golan Heights declaration made by Trump is now a perfect explanation to conquer any territory by force. Perfect explanation for North Cyprus, Abkhazia, South Osetia, Tibet, Crimea, Donbas, West Sahara, Karabakh and Guantanamo. But this is also a perfect strategy for Trump to win 2020 presidential election by becoming most proisraelian US president in history. And thats all about that if Im right how strong proisraelian lobby is in US. When OAS decides to go in like when they did during Grenada, who do you think they will target first?